Marreese Speight is a professional American basketball player for Orlando Magic. During his college days, he played basketball at the University of Florida. Moreover, he was also the freshman for Florida Gators' NCAA in 2007. After his college career, Philadelphia 76ers selected him in the 2008 NBA draft. Marreese Speight was born on August 4, 1987, in St. Petersburg, Florida, United States. He was born to Wilbur Speight and Regina Glenn Speight. Speight grew up along with his three siblings. Speight completed his early education from the Admiral Farragut Academy. Since his school days, he started playing basketball along with the school team. Moreover, he also played at Hargrave Military Academy and Gibbs High School. Well, he completed his graduation from the University of Florida. Speight developed his passion towards playing basketball since his school days. While playing for the school, in 2006, the Rivals.com listed him as the No. 13 power forward and the No. 51 player in the nation. He continued his basketball career in college too and participated in all the games of 2006-2007 season. Well, with his best performance during the season, he was qualified for 2008 NBA Draft. After his graduation, Philadelphia 76ers selected him in the 2008's NBA Draft. However, on July 18, 2008, Marreese Speights officially signed with the Philadelphia. Within the first season, he performed well for the club and made a good impression. During 2009-2010 season he suffered a knee injury so, he missed 14 games the following season and played for the club until 2011. Coming to 2012, Memphis Grizzlies signed a contract with Speight for the 2012 season on January 4. On June 29, 2012, he extended his contract. Furthermore, he re-signed a contract worth $8 million for two years. Along with Wayne Ellington and Josh Selby, he was traded to Cleveland Cavaliers on January 22, 2013. But just playing for few months he left the club and joined Golden State Warriors on July 12, 2013. Speight won his first NBA championship in 2015 NBA by defeating Cleveland Cavaliers. In the 2014-15 season with The Warriors, he became the highest scorer of the club. Moreover, during the 2015-16 season, he scored the highest scores for the club. As he made the highest score, his team was able to be the top scoring team. After playing 14-15 season with The State Warriors, on July 12, 2016, he signed for the Los Angeles Clippers. But lefty the club after a single season, he signed up for the Orlando Magic on July 27, 2017. Professional basketball player Marreese Speights is not married yet. Moreover, he is not dating anyone. Till now he hasn't dated any girl in his whole life. Although he is not married yet and does not have any girlfriend, his sexuality is straight. He hasn't done or said anything that makes us feel doubt about his sexuality. Young star Speights is much more focused on building his career. 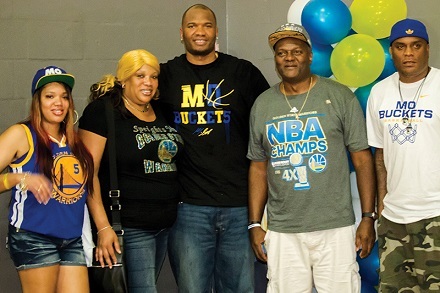 The famous basketball player Speights holds an American nationality and falls under African ethnic group. Talented basketball player Marreese Speights is one of the richest basketball players with a good net worth. According to the recent data, his current net worth is $12 million and his salary is $1.404 million.